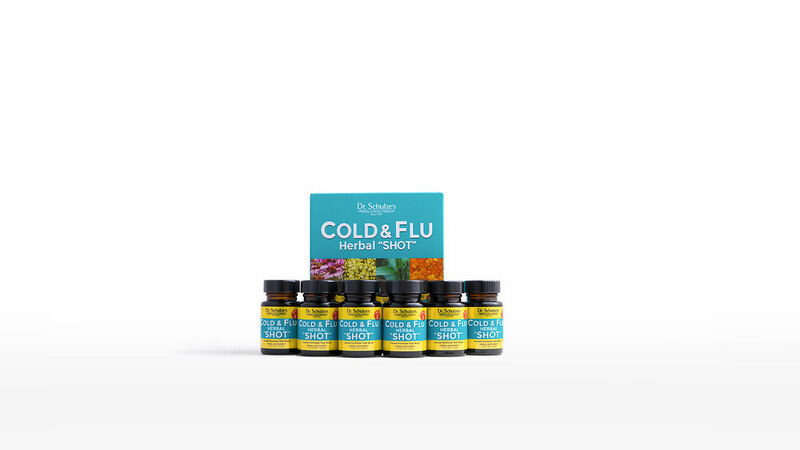 Benefits: Cold & Flu Herbal "SHOT"
Dr. Schulze’s Cold & Flu Herbal “SHOT” contains 20 POTENT herbs, premixed for easy use! SUPERCHARGES your immune system to better protect you during winter months! A Magical Formula to Rock-n-Roll! Dr. Schulze, you never cease to amaze me! This new magical formula washes EVERYTHING out! It was Wednesday afternoon and I was feeling terrible. But the president of my company says Dr. Schulze has a new magical formula. 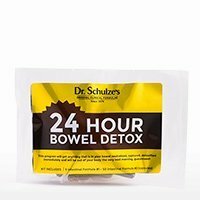 Why do I even doubt Dr. Schulze, because after I had my 6-pack, I was ready to rock-n-roll and conquer the world! A friend stopped by with a box of your Cold & Flu Herbal ‘SHOTS’...and once again, I was amazed! Thank you for your fight to keep these products available. A Year of Having Healthy Children! I have 3 sons ages 6, 4, and 2. I give them 1/2 ounce 3 times a week in the morning before they go to bed of the Cold & Flu SHOT. Thank you! Thank you! Spend Money on Products That WORK! Drink ONE bottle (entire contents) straight, or mixed with up to 16-ounces of water or juice. For general immune boosting, take ONE per day for six straight days. For serious cases, you may take up to ONE per hour. Shake well before using. FOR ORAL CONSUMPTION ONLY. Take 1.5-oz straight, or mixed with up to 16-ounces of water or juice. For general immune boosting, do this once per day for six straight days. For serious cases, you may do this once per hour. Shake well before using. FOR ORAL CONSUMPTION ONLY. THE ULTIMATE WEAPON TO STOP A COLD OR FLU! One dose of Dr. Schulze’s Cold & Flu Herbal “SHOT” combines the exact same 12 droppersful of Echinacea Plus and 6 droppersful of SuperTonic that Dr. Schulze recommends when making his Defender Drink. It also includes many more herbal tinctures, herbal concentrates and even specific herbal-vitamin concentrates, like organic Acerola Cherry, Blackberry, Yarrow Flowers, Boneset Herb, Desert Sage Leaf, Lobelia Herb and Seed, Elecampane Root, Coltsfoot Herb, Horehound Leaf, Cherry Bark, Thyme Leaf, Licorice Root, Kola Nut, Coffee Bean, Fennel Seed and Elderberry. Now, all you have to do is empty one 1.5-ounce dose of the Cold & Flu Herbal “SHOT” into a sports bottle and add up to 16 ounces of water and/or juice, and you have the Defender Drink. Or, just take 1.5 ounces straight, gargle, swallow it and start feeling better. Nothing could be easier, simpler and faster…and more potent! 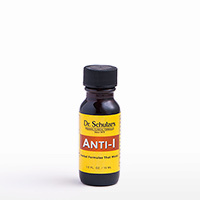 A few years back, in his endless quest for making things better, Dr. Schulze pre-blended his two most powerful formulas to strengthen your body’s natural defenses. 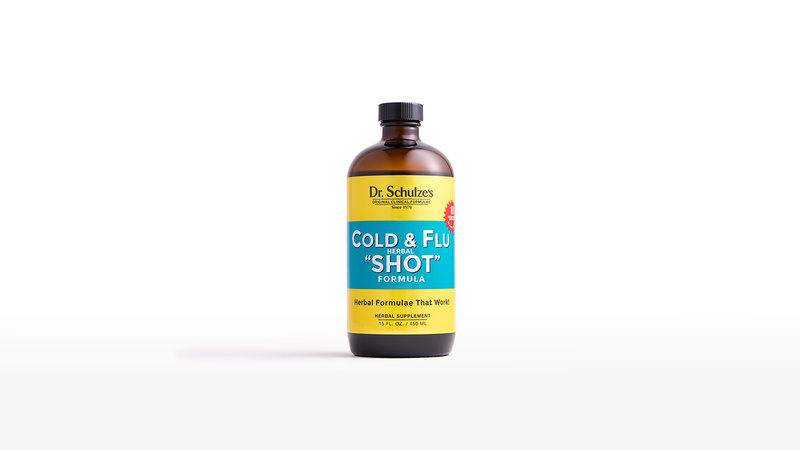 He combined Echinacea Plus and SuperTonic in one formula, and added many potent herbs and a large dose of Acerola Cherries to give you 1,000% (10 times) your needed Vitamin C — all into one formula: Dr. Schulze’s Cold & Flu Herbal “SHOT”! At the first sign of that “uh-oh” feeling, take a heroic dose of herbs—Dr. 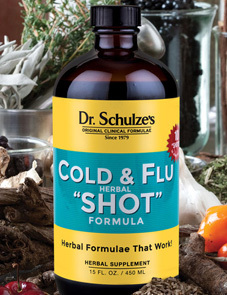 Schulze’s Cold & Flu Herbal “SHOT”—and do it IMMEDIATELY! Use two, three or up to six bottles a day! DR. SCHULZE’S COLD & FLU HERBAL “SHOT” IS THE ULTIMATE HEROIC DOSE!